Funnily enough, if you do a Google search for "heroku php" the first thing that comes up is PHP Fog. They provide hosting for up to 3 projects for free on shared hosting. They also offer MongoDB and application monitoring as add-ons. After logging in, click "Launch New App". This brings you to a screen where you can choose from several pre-built applications (popular CMS or blogging platforms) or skeleton projects built on the most popular PHP frameworks. For my purposes, I chose "Custom App". This will build an application containing exactly one "Hello world" PHP file. Enter a password for the MySQL database that will be set up, and a subdomain. The subdomain must be unique among all PHP Fog apps, and the setup won't continue until it is. After your app is set up, it can be given a custom domain name from $5 per month. Click "Create App". This will bring you to your project's management page. From here, you can find everything you need to start developing your app. The git repository address for the app is displayed, as are the database credentials, helpfully wrapped in a mysql_connect function call. Eventually, the "Status" light will turn green, indicating that your app is available. Clicking "View Live Site" brings you to your application, live to the world. Not much there. Time to change that. Reload your site to see the changes. Follow the "Hello" link, and play with the URL to see the results. After the holidays, I hope to actually build something interesting on the platform. I recently found myself needing to make cUrl calls from the command-line to an endpoint which returned JSON responses. Rather than parsing through the JSON as a string, or downloading some third party tool to format it for me, I created this handy Bash alias that decodes JSON from the command-line using PHP. I had a great time at CodeWorks 2011 in Raleigh this week, put on by the great folks at php|architect. Here is a rundown of the presentations, with some of my thoughts. Beth Tucker Long started out the day with a talk about continuous integration tools for automating away the pain of building and deploying PHP projects. One of her main themes was the importance of standardization in your code to avoid wasting mental effort on things like variable and class naming, which lines to put curly braces on, or how many spaces are in a single indent (editor: the answer is none; use a tab character.) The same can be said about manual testing and deployment processes. The tools discussed included PHP_CodeSniffer, the venerable and nigh ubiquitous PHPUnit, and multiple options for automated builds and testing (CruiseControl and Jenkins/Hudson.) Beth also talked about Phing, which is one of my new favorite tools. She also covered tools for automated documentation and report generation. I would have gone with DocBlox instead of phpDocumentor, but that's just a personal preference. The most useful thing about most of these tools is that many of them are aware of each other, directly or through plugins, and can be chained together to build a flexible CI pipeline. Most of the tools I had already heard of or am actively using. In addition to PHP_CodeSniffer for coding standards compliance, I would also throw in one or both of PHP Mess Detector and PHP Copy-Paste Detector. These three tools together give great insights into the current state of your code base and its future maintainability, which Beth mentioned when discussing "technical debt". An important thing that Beth stressed at the end of her presentation was that not every project requires the use of every tool. It's important to take into account things like size/complexity of the project, timeline, budgets and team size. I think this was a valuable piece of advice that a lot of people forget. If you're anything like me, when you first learn about a new tool your response is to go out and find as many ways to use it as possible. I'm glad Beth ended with the reminder to keep in mind the constraints of your project when picking which tools to apply. Next up was Jason Austin, who is one of the coordinators of my local PHP meetup group. Jason's talk was a call for all developers to find their passion. His two passions are beer and PHP, so he decided to combine them into a side project, and Pint Labs was born. All developers should find a side project related to their passion. It is something he looks for as a hiring manager. They also prevent burnout in your day job. Side projects give developers an opportunity to experiment without the consequences of failure that usually accompany employed or contract work. More than that, they allow for greater opportunities to bring new knowledge to a paid job. "The dumbest thing a manager can do is stop their developers from working on their own side projects," was one of my favorite lines from the presentation. I can't agree more, and I'm lucky to have never worked in an environment where an employer has either forbidden me from having side projects, or claimed that anything I work on in my own time belongs to the company. I learned at lunch that many people aren't so fortunate. I would be very wary of any employment where that was the case. As for side projects, even if you don't start your own, there are tons of open source projects out there who would love more hands on keyboards helping out. There is no excuse for not getting involved, even at a small degree. Of all the talks, Cal Evans's about the new features coming in PHP 5.4 was probably the least applicable to my current work, but was one of my favorites. Cal is an engaging speaker, and there is some really cool stuff coming up in PHP. The bits I was most interested in were improvements in Closures, Traits, and the built-in HTTP server. For those who don't know, in PHP 5.4, closures created in an object method will be able to reference $this from within the closure. That may not seem like a big deal, but if you're working with classes that build themselves or are factories for other objects, having the ability to reference the creating object is incredibly useful. The closure can access protected and private stuff from the instantiated class. One other thing that Cal mentioned was the new JsonSerializable interface. This is a great addition for anyone who deals with sending JSON responses in PHP. I only have one problem with it: there is no complementary JsonUnserializable interface that would allow an object to populate its properties from a JSON string. I don't watch the PHP internals list, so I don't know why it was decided not to include such obvious functionality. Does anyone have any insights? After lunch, we got right into the second half of the day with Marco Tabini and a presentation on refactoring. The presentation centered around a piece of "legacy" code. He wrote a test to assert the existing behavior, then proceeded to follow the refactoring steps of abstract, break (apart) and rename to show how the code could be made more maintainable and testable. Marco's talk was to the point, with a great example, but it tilted more towards the theoretical side of why you should refactor. It also took a very purist look at what refactoring means (absolutely no changes to interface, even changes that would not affect calling code.) While I agree that this is the technical definition of refactoring, it's hard to start poking at a piece of code without wanting to improve its usage instead of just its implementation. I think there is a fuzzy line that developers cross often, at least mentally, between refactoring and improving the interface. At the after-party, some of my coworkers had a longer discussion with Marco where he expounded on some of the ideas he presented and gave some more practical advice for our own legacy application. I wasn't there, but I do appreciate speakers and experts taking the time to apply their own knowledge and experience to their audience's issues. So, thank you Marco. Terry Ryan was the representative from Adobe, one of the conference sponsors. His talk began with a quick demo of building an app with jQuery Mobile. I'll admit, I'm not a big fan of doing UI or front-end development, but even I could see how working with a library like that could make such development fun. It seems some of the kinks still need to be worked out, but it looks like a promising library and I hope to play with it some day soon. Following that was an overview of PhoneGap, and more impressively, PhoneGap:Build, where Terry tweaked his application, ran it through the cloud building service, and had the new app deployed to his phone in just a few minutes, all live. Impressive stuff! Then, Terry showed off some of the things Adobe has in the works with CSS shaders. The effects he demoed were neat to look at, but I don't feel like there was anything there that WebGL doesn't already cover. For a finale, Terry live demoed Adobe's Proto application, which allows tablet users to create UI wireframes and mock-ups by drawing with their fingers. Imagine a virtual whiteboard that takes your scratchings and turns them into divs, tables, text, headers and image frames live while you draw. Now imagine sharing that view with remote users, also live. Very cool stuff. Keith Casey's presentation was an informative look into the philosophy and reasoning behind REST architecture, and was another one of my favorites. He talked about the myth of "strictly RESTful" and how the vast majority of APIs out there don't even come close (hint #1: if you're passing an authentication token or session ID on every request, your API is not RESTful.) I also liked his use of "-ilities": discoverability, readability, flexibility, maintainability, etc. He used Twilio as his example API, and showed how a good REST API should follow the 6 constraints of REST: client-server, stateless (where most authentication schemes fail at being REST), cacheable, layered, uniform interface, and code-on-demand. The last constraint is the hardest one for me to get my head around, so I appreciated his use of GMail as an example of providing not just data, but the code that manipulates that data. I think that JSONP might also fall into that category, but I didn't get a chance to ask. Like with Marco's talk, I appreciated the theoretical nature of the topic, but I would have liked some more examples of real-world practicality trumping academic purity. It's always nice when a speaker acknowledges that sometimes you just need to get things done and points out which portions of a technology are more flexible than others and amenable to not following the letter of the law. Besides that, I thought it was a great look into why REST is the way it is. No development conference is complete without an after-party and no after-party is complete without free beer. I'd like to thank the folks at SugarCRM for sponsoring the after-party at Tir na nOg, one of my favorite pubs in downtown Raleigh. Besides free booze, I love to talk with speakers and other conference attendees in a less formal setting. It's great to get to know other developers at the top of their craft, and the people in the PHP community are some of the friendliest and easiest going. It's one of the reasons I love being a PHP developer so much. Keith, his coworker at Twilio Devin Rader, a few other people and I had a great conversation that shifted topics basically at the speed of thought. John Mertic from SugarCRM was there and answered some of my questions, and Beth explained the php|architect submission process in a way that didn't sound scary at all. To all the conference speakers, organizers and attendees, I want to say thank you for a fun and educational experience. Hopefully some of us will meet up again at phptek 2012! This is Part 2 of a series on setting up a development environment for building projects using the graph database Neo4j and PHP. In Part 1 of this series, we set up unit test and development databases. In this part, we'll build a skeleton project that includes unit tests, and a minimalistic user interface. All the files will live under a directory on our web server. In a real project, you'll probably want only the user interface files under the web server directory and your testing and library files somewhere more protected. Also, I won't be using any specific PHP framework. The principles in the code below should apply equally to any framework you decide to use. Create a project in a directory on your web server. For this project, mine is "/var/www/neo4play" on my local host. We'll also need a Neo4j client library. I recommend Neo4jPHP (disclaimer: I'm the author) and all the code samples in Part 2 use it. Test the setup by browsing to http://localhost/neo4play. You should see the output of `phpinfo`. Now we'll create a bootstrap file that we can include to do project-wide and environment specific setup. Call this file "bootstrap.php" in the root project directory. The main point of this file at the moment is to differentiate between our development and testing environments, and set up our connection to the correct database. We do this by attaching the database client to the correct port based on an application constant. The purpose of this file to to tell our application bootstrap that we are in the "testing" environment. Then it cleans out the database so that our tests run from a known state. So we know we want a domain object called "Actor" (apparently we're building some sort of movie application) and that Actors have names and ids. We also know we want to be able to look up an Actor by their name. If we can't find the Actor by name, we should get a `null` value back. Excellent, our tests failed! If you've been playing along, they probably failed because the "Actor" class isn't defined. Our next step is to start creating our domain objects. So far, we only have one domain object, and a test that asserts its behavior. In order to make the test pass, we'll need to connect to the database, persist entities to it, and then query it for those entities. We have a stub class for the domain object. The tests will still fail when we run them again, but at least all the classes should be found correctly. Let's start with finding an Actor by name. 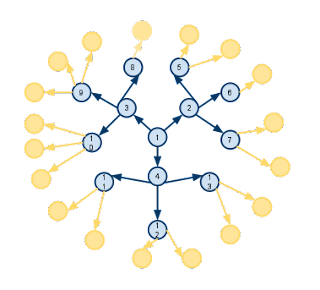 With our knowledge of graph databases, we know this will involve an index lookup, and that we will get a Node object in return. If the lookup returns no result, we'll get a `null`. If we do get a Node back, we'll want to hold on to it, for updating the Actor later. The main thing we're trying to accomplish here is keeping our domain classes as Plain-Old PHP Objects, that don't require any special class inheritance or interface, and that hide the underlying persistence layer from the outside world. The tests still fail. We'll finish up our Actor class by saving the Actor to the database. It's time to start tacking on some user functionality to our application. Thanks to our work on the unit tests, we can create actors in the database and find them again via an exact name match. Let's expose that functionality. Browse to your index file. Mine is at http://localhost/neo4play/index.php. You should see the page you just created. Enter a name in the "Add Actor Name" box and click the "Add" button. If everything went according to plan, you should see the actor name and the id assigned to the actor by the database. Try finding that actor using the search box. Note the actor's id. Browse to http://localhost:7474/webadmin/# and click the "Data browser" tab. Enter the actor id in the text box at the top. The node you created when you added the actor should show up. The interesting thing is that our actual application doesn't know anything about how the Actors are stored. Nothing in "index.php" references graphs or nodes or indexes. This means that, in theory, we could swap out the persistence layer for a SQL databases later, or MongoDB, or anything else, and nothing in our application would have to change. If we started with a SQL database, we could easily transition to a graph database. Your development environment is now set up, and your application is bootstrapped. There's a lot more to add to this application, including creating movies, and linking actors and movies together. Maybe you'll want to add a social aspect, with movie recommendations. Graph databases are powerful tools that enable such functionality to be added easily. All the code for this sample application is available as a gist: http://gist.github.com/1341833. One of the cooler features of PHP 5.3 is the ability to package up a set of PHP class files and scripts into a single archive, known as a PHAR ("PHp ARchive"). PHAR files are pretty much equivalent to Java's JAR files: they allow you to distribute an entire library or application as a single file. I decided to see how easy it would be to wrap up Neo4jPHP in a PHAR for distribution. Surprisingly, there isn't much information out there on creating PHAR files outside of the PHP manual and a few older posts. They deal mainly with creating a PHAR with a hand-written script specific to the project being packaged, using PHP's PHAR classes and methods. Since I also started playing with Phing recently, I decided to see if I could incorporate packaging a project as a PHAR into my build system. It turns out, it's pretty easy, given that Phing has a built-in PharPackage task. > sudo sh -c "echo 'phar.readonly=0' > /etc/php5/conf.d/phar.ini"
In a PHAR, the stub file is run when the PHAR is `include`d or `require`d in a script (or when the PHAR is invoked from the command line.) The purpose of the stub is to do any setup necessary for the library contained in the PHAR. Since I'm packaging a library, the stub I created doesn't do anything more than set up autoloading of my library's classes. The "__HALT_COMPILER();" line must be the last thing in the file. The call to `Phar::mapPhar()` registers the PHAR with PHP and allows any of the files inside to be found via the "phar://" stream wrapper. Any files or directories contained in the PHAR can be referenced as "phar://myproject.phar/path/inside/phar/MyClass.php". Since all my project files are namespaced, autoloading is a matter of translating the class name into a path inside the PHAR. Phing's documentation is pretty extensive, so I won't go into to much detail about what each piece of the build file means. The important part is the PharPackage task in the "package" target. The important part is the "package" target, the default target of this build file. It depends on the "build" target, whose only purpose is to copy out all the files that will be packaged in the PHAR into a separate "build" directory. This strips out any testing, example or other non-library files. Any previously created package is deleted. The main work of packaging is done via the "pharpackage" task. In this case, I'm specifying that the output package should be called "myproject.phar" and be put in the same directory as the build file, the PHAR should be compressed with "gzip", the stub to load when requiring the file is at "./stub.php" and the PHAR should be signed with a SHA1 hash. Metadata appears to be optional, but Phing throws up a nasty looking warning if it's not there (it tries to convert an empty value to an array.) Nested metadata is turned into a PHP array and serialized. If PHP doesn't complain about a missing class, the PHAR set up correctly and autoloading is working. The Neo4jPHP PHAR is available at http://github.com/downloads/jadell/Neo4jPHP/neo4jphp.phar. Overall, I think it was pretty well received. I didn't mean for it to last an hour and a half, but there it is. There were a lot of new folks there; I'm encouraged at the enthusiasm of the developer community in the Triangle region. Thanks for having me! I'm pretty excited about a new development at my office. Based on my team's success in increasing our productivity, efficiency and transparency, another team has decided to adopt "agile-like" practices. The most interesting thing is that this team isn't a technical team at all. break-down of larger, more ambiguous mid- to long-term goals into shorter, more easily tracked tasks. team stand-up meeting every day in the morning, with each team member answering "What did I do yesterday? ", "What am I going to do today?" and "Is anything preventing me from getting things done?" a week-long calendar set up inside the team's area in a highly trafficked place so that anyone else (including team managers!) can see at a glance how the team is doing without having to ask individual team members. periodic gathering of the team to discuss the new processes, how the processes are helping/hindering and what to change to make the team more efficient. The team's goals are very different from that of a software development team, so we encouraged them to not follow our process dogmatically, and instead, to come up with methods that work for their team's unique needs (the core of "a"gile vs. "Agile".) For instance, my team operates on a 2 week sprint cadence (a new sprint every two weeks.) Their team receives the team goals on a monthly basis. Rather than adopt 2-week or 4-week sprints, they have chosen to break up the monthly goals into smaller and more transparent 1-week goals. This provides them with earlier warning if things start to go sideways, and provides motivation to not let things stack up until the end of the month. Also, their work does not fit easily into "delivering feature or product X by the end of the month." Rather, they are tasked with having certain regions of the country covered by certain baselines of recruitment effort (for partner and vendor recruiting.) So the "User Stories" on their backlog are phrased as "15% coverage of NJ/NY metro area" or "Decrease turnover 10% in southern VA." Their tasks become things like calling or emailing specific contacts, setting up conference calls and facilitating the transition of a contact into a partner. The Scrum board also has little stickers (a frog for their direct manager and Venom for her manager) that they can attach to a specific task to signal that they need additional help with an item. I think this is a neat idea, because it means that their managers don't have to ask them many times a day if everything is going smoothly. 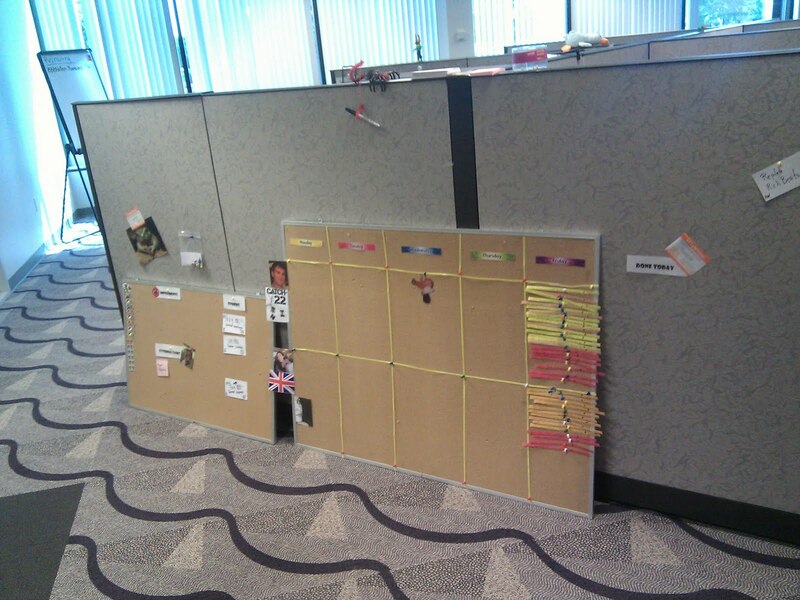 A quick glance at the Scrum board gives them the same information. A few sprints ago, my team decided to start sharing a few minutes about our agile practices at each Sprint Review. I'm really glad to see that not only were people not spacing out (which I had feared they might) but were actually absorbing the information and thinking about how it could apply to their own team. I'm very excited to see how this new process works for our recruitment team. There are some usage examples included. It's a beta release, so please be gentle (on me, that is; be as rough as you want with the code.) If anyone finds any bugs or has feature requests, please use the GitHub issues page. Update 2011-07-08:I would be remiss if I didn't mention the other PHP Neo4j REST client available at https://github.com/tchaffee/Neo4J-REST-PHP-API-client. It is built for the current stable release of Neo4j 1.3. In my previous post I talked about graphing databases (Neo4j in particular) and how they can be applied to certain classes of problems where data may have multiple degrees of separation in their relationships. 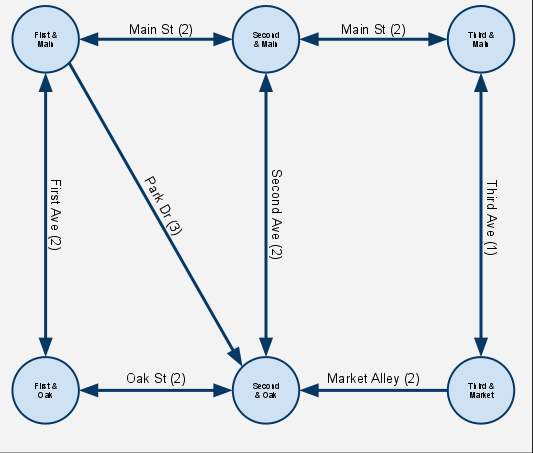 The thing that makes graphing databases useful is the ability to find relationship paths from one node to another. There are many algorithms for finding paths efficiently, depending on the use case. First, we set up a list of the intersections on the map, and also a list of the streets that connect those intersections. 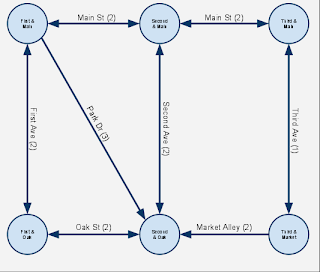 Each street will be a relationship that has data about the streets direction, distance and name. Then, we create each intersection node. Each node is also added to an index. Indexes allow stored nodes to be found quickly. Nodes and relationships can be indexed, and indexing can occur on any node or relationship field. You can even index on fields that don't exist on the node or relationship. We'll use the index later to find the start and end points of our path by name. Finally, we create a relationship for every street. Relationships can have arbitrary data attached to them, just like nodes. 1: Head north on Second Ave. for 200 yards. 2: Turn left, and continue west on Main St. for 200 yards. 1: Head west on Main St. for 200 yards. 2: Turn left, and continue south on Second Ave. for 200 yards. 1: Head south on Third Ave. for 100 yards. 2: Turn right, and continue west on Market Alley for 200 yards. If there were another path with the same total distance, it would also be displayed. Path cost ignores the number of relationships in the path. If there were a path with 3 relationships totaling 300 yards, and another with 1 relationship totaling 300 yards, both of them would be displayed. Neo4j also comes with an expressive traversal API that allows you to create your own path finding algorithms for domain specific needs. Update 2011-09-14: I've put a lot of effort into Neo4jPHP since this post was written. It's pretty full-featured and covers almost 100% of the Neo4j REST interface. Anyone interested in playing with Neo4j from PHP should definitely check it out. I would love some feedback! But suppose you want to get the names of all the actors who have been in a movie with someone who has been in a movie with Kevin Bacon. Suddenly, you have yet another JOIN against the same table. Now add a third degree: someone who has been in a movie with someone who has been in a movie with someone who has been in a movie with Kevin Bacon. As you continue to add degrees, the query becomes increasingly unwieldy, harder to maintain, and less performant. This is precisely the type of problem graph databases are meant to solve: finding paths between pieces of data that may be one or more relationships removed from each other. They solve it very elegantly by modeling domain objects as graph nodes and edges (relationships in graph db parlance) and then traversing the graph using well-known and efficient algorithms. Now it becomes very easy to find a path from a given actor to Kevin Bacon. Neo4j is an open source graph database, with both community and enterprise licensing structures. It supports transactions and can handle billions of nodes and relationships in a single instance. It was originally built to be embedded in Java applications, and most of the documentation and examples are evidence of that. Unfortunately, there is no native PHP wrapper for talking to Neo4j. Luckily, Neo4j also has a built-in REST server and PHP is very good at consuming REST services. There's already a good Neo4j REST PHP library out there, but I decided to write my own to get a better understanding of how the REST interface actually works. You can grab it here and all the code examples below are written using it. The concepts can easily be ported to any Neo4j REST client. Each node has `setProperty` and `getProperty` methods that allow storing arbitrary data on the node. No server communication happens until the `save()` call, which must be called for each node. The `relateTo` call returns a Relationship object, which is like a node in that it can have arbitrary properties stored on it. Each relationship is also saved to the database. The direction of the relationship is totally arbitrary; paths can be found regardless of which direction a relationship points. You can use whichever semantics make sense for your problem domain. In the example above, it makes sense that an actor is "in" a movie, but it could just as easily be phrased that a movie "has" an actor. 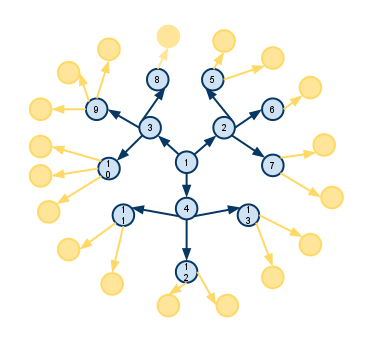 The same two nodes can have multiple relationships to each other, with different directions, types and properties. A path is an ordered array of nodes. The nodes alternate between being actor and movie nodes. `getRelationships` returns an array of all relationships that a node has, optionally limiting to only relationships of a given type. It is also possible to specify only incoming or outgoing relationships. We've set up our data so that all 'IN' relationships are from an actor to a movie, so we know that the end node of any 'IN' relationship is a movie. There is more available in the REST interface, including node and relationship indexing, querying, and traversal (which allows more complicated path finding behaviors.) Transaction/batch operation support over REST is marked "experimental" for now. I'm hoping to add wrappers for more of this functionality soon. I'll also be posting more on the different types of problems that can be solved very elegantly with graphing databases. The next post dives into a bit more detail about path-finding and some of the different algorithms available. Today on Cal Evans' "Voices of the ElePHPant" there was an interview with Bulat Shakirzyanov. His comments about mocking PHP's built-in functions reminded me of this PHP built-in mocking library I had made a little while ago, then forgotten about. Bulat's example talks about `mkdir`, which the built-in mock library would handle, but for filesystem specific functionality, I also highly recommend vfStream. It allows you to create a virtual filesystem, comeplete with directory hierarchy and files with contents, all from within a unit test, and all without needing an actual filesystem. On the first evening of PHPComCon this year, Tropo sponsored a beer-and-pizza-fueled hackathon. Having never heard of Tropo before, I decided to check it out. To explore a little deeper, I thought it would be neat to create a voice chat-bot. The idea would be that a caller could talk to an automated voice in a natural way, and the voice would respond in a relevant way and push the conversation along. Since I wasn't aiming for Turing test worthiness, a good starting point was ELIZA, one of the first automated chat-bots. I thought it was a pretty ambitious project, but it turns out that Tropo's system handles all of the functionality right out of the gate. The docs do a great job of explaining setting up an account and creating an application, so I'm going to jump right into the code (in PHP). It's important to note that the opening <?php and closing ?> should be left out of this file, or the next bit will fail. The main functionality of the application is in the `Eliza` class. Eliza will translate a user input string into a response, which it will then use to prompt the user. The `ask()` function in the `hears()` method is functionality provided by Tropo's system that takes care of the text-to-speech and speech-to-text aspect of prompting the caller, and then waits for the caller to respond. The `choices => [1 DIGIT]` option to `ask()` hints that we expect the user to respond to our prompt with a single 0-9 character. This is the entry script for the application, which can be set on the "Application Settings" page. Unfortunately, it does not look like Tropo supports `require` and `include` in their system. Fortunately, what they do provide are URLs to download the contents of any hosted file via simple `file_get_contents`. So we "inlcude" our Eliza.php file by downloading its contents, then `eval`ing them into the running scripts scope. Note: Yes I could have just written the contents of Eliza.php into the chatbot.php file, but a) it was more fun to try and find a way around that limitation :-) and b) many developers separate their code this way to keep it clean, encapsulated and reusable and this demonstrates a way to accomplish that. The code is fairly self-explanatory: "include" and instantiate Eliza, then enter a prompt-respond loop which will last until the caller hangs up. `_log()` outputs to Tropo's built in application debugger. I have to say congratulations to Tropo for creating a platform that makes all this easy. I had this up and running (except the file include portion) in about 15 minutes. You can try this out for yourself by calling (919) 500-7747. Caller: I'm building a voice chat application. Eliza: Tell me more about voice chat application. Eliza: How do you feel about that? Caller: I think it's pretty neat. There are probably a hundred Eliza implementations on the web, and at least a dozen are written in PHP. I grabbed the first one I found, shoved it into the `Eliza::respondsTo()` method, and called up my application. And this is where I hit the iceberg. In order to accomplish what I wanted, I needed the `ask()` function to be able to accept and parse any spoken words into a string. This meant getting rid of the `choices => [1 DIGIT]` line. As soon as I called, Eliza started prompting me over and over for input, until Tropo's system killed the loop and hung up. Luckily, a Tropo guy (who was great to talk to, but who's name I have unfortunately forgotten) informed me that `ask()` works by using the `choices` option as training for the speech-to-text parser. There is a way to do generalized speech-to-text but it is incredibly processor intensive, and would have to make use of an asynchronous call. Later that evening, @akalsey confirmed that the current state of the technology (everyone's, not just Tropo's) makes generalized real-time speech-to-text processing impossible. So the dream of speaking with Eliza instead of just IMing with her dies unfulfilled, or is at least put on the shelf until technology catches up with ideas. I did learn some about Tropo's service, though, so I count the hackathon successful. Thanks again, Tropo, for the great new tool! We end up writing quite a few full-stack integration tests. As the workflows for our projects get longer and more complex, the corresponding Zombie and Vows tests also get longer and more complex. Soon enough, a single test can be nested 15 or 20 levels deep, with a mix of anonymous functions and commonly-used macros. So we created prenup, a syntactic sugar library for easily creating Vows tests. Prenup provides a fluent interface for generating easy to read test structures as well as the ability to reuse and chain testing contexts. Every `sub()` call generates a new sub-context, and every `vows()` call attaches a vow assertion to the most recent context. `parent()` can be called to pop back up the chain and attach parallel contexts. If a context is saved, it can be reused in other chains. When `seal()` is called, it will generate the same structure as the original test.